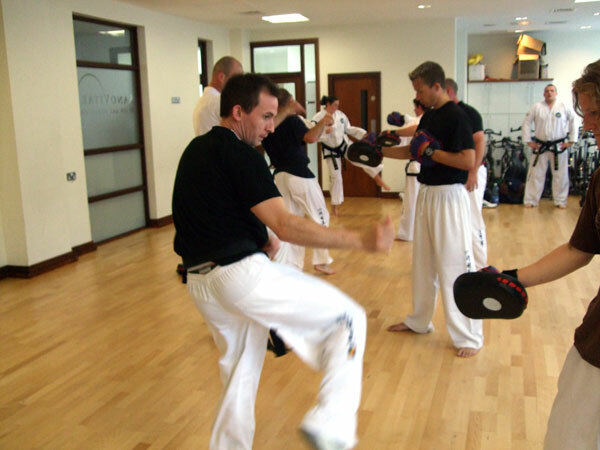 Training is open to all RITA adults. Everyone is invited to come along to try out for the National Squad and those who’ve never been before are encouraged to give it a go. We are also looking to find new talent with potential to represent Ireland at international competitions. So even if you want some practice before the Irish Open, to improve fitness or just want to see what training is like you are more than welcome to attend. Congratulations to the Irish Team who came back from the EITF European Championships in Liverpool with 1 Silver and 4 Bronze medals! With over 800 competitors from 32 countries competiting it was a great achievment. The Team was made up of 12 Black Belts and 5 Red Belts accompnied by National Coach Master Doyle, Development Coaches Mr Fox and Mr Tobin plus Umpires Master Barrett, Master Howard, Master Jacob and Master Keane. For many it was their first experience of high class European competition and some had moved into new divisions so it was an excellent opportuntity to test their skills. Our first medal came in the 5th Dan patterns division with Mr Leon McSherry from Grandmaster Hoowards Dojang getting into the final for the second year in a row. He beat competitors from Russia and Greenland to set up a great final against France. It was the final that everyone had hoped for as both had the best technique in the division with the Frenchman edging out Mr McSherry on the judges scorecards to take Gold. Next came 3 Bronzes in quick succession with Abbie O'Neill, Trivo Tijanic and Andrew Loo all from Carrick-on-Suir picking up medals in their Sparring sections. The final medal came on the last day with Mr John Egan from Old Bawn winning Bronze in the veteran sparring division after wins over Spain and England he just lost out to Scotland in the Semi final. There were some great perfomances with many making it to quarter finals and just missing out on medals. With a very young team the future looks bright! Well done to everyone on their hard work and dedication. This is the last chance for anyone who wants to be considered for the ITF World Championships in Pyongyang. 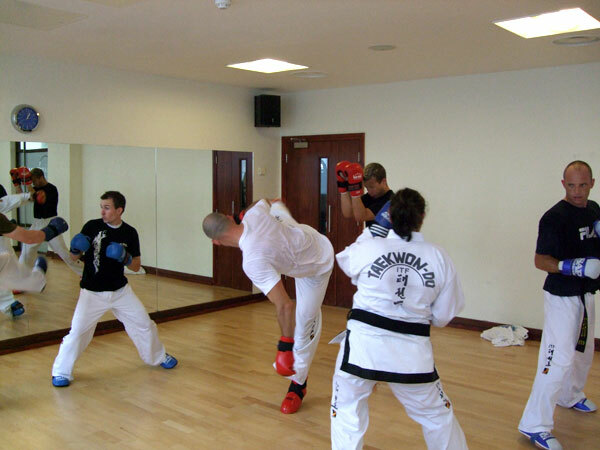 The training is also open to ALL red and black belts. 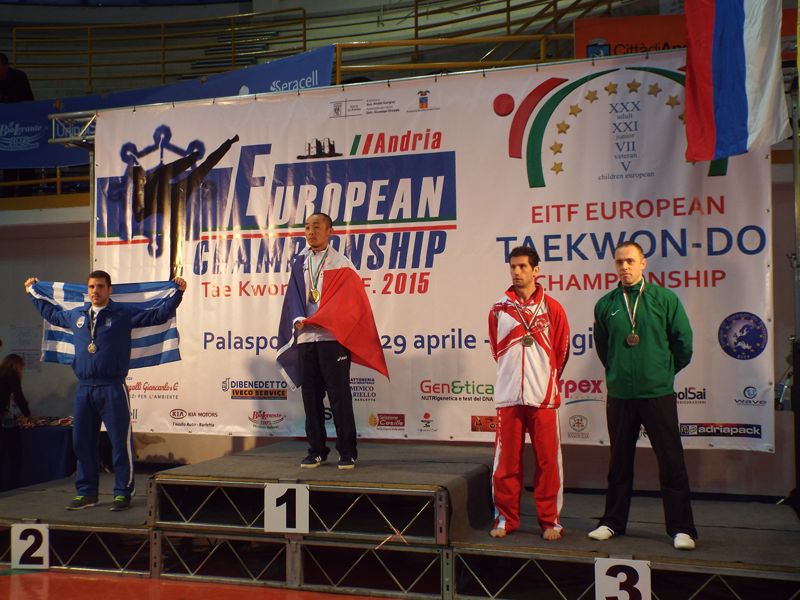 The recent EITF European Championships, which were hosted in the Greek city of Thessaloniki from 11th to 18th April, were the largest ever with over 700 competitors from 31 Countries competing. The RITA sent a Squad of 11 competitors accompanied by National Coach Master Stephen Doyle, Colour Belt Development Coach Ms Audrey Condon and Umpires Senior Master Robert Howard and Master Floyd Keane. 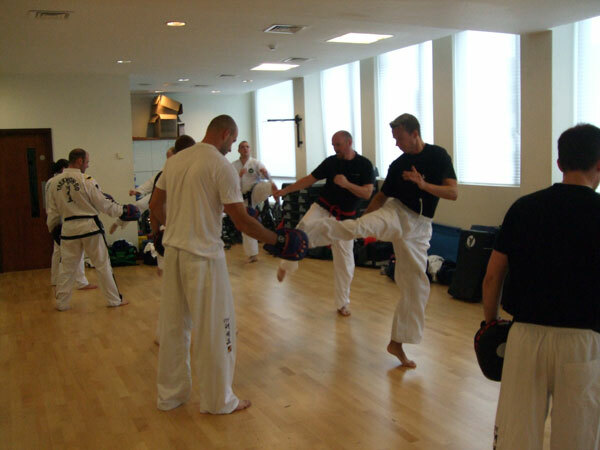 The squad consisted of 6 Black Belts and 5 Red Belts that competed in Adult, Junior and Child divisions. For most it was their first experience of a high level International event and it was great preparation for the 2017 Euros in Liverpool, which is what they are training for. The event was held in a 9,000 seat stadium and it was a big step up from what most were used to. Day 1 of the competition was not until the Thursday so the Squad had two days to acclimatise and prepare after arriving late on the Monday night. But once the competition began there was no rest for our coaches as we had competitors nearly in every ring at the same time. Luckily our more experienced senior competitors Mr Leon McSherry and Mr Martin Mahoney were there to help. 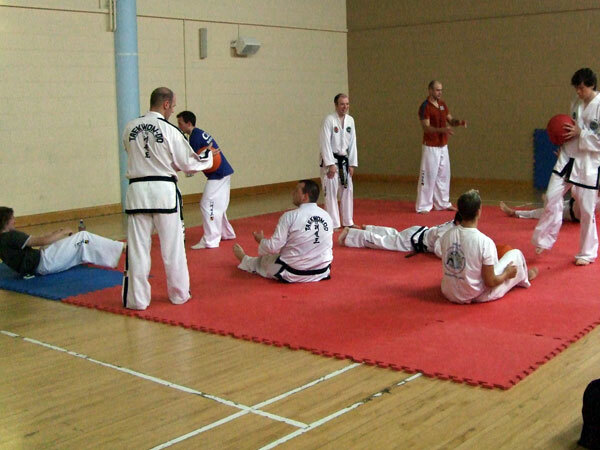 In the Pattern divisions the quality of the RITA training was evident with nearly all the squad winning at least one round. 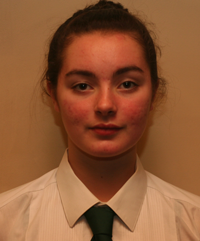 There was a great performance by Ms Caoimhe Keogh from Galway who after wins over Spain and Slovenia narrowly lost out 3-2 in the 2nd Dan Junior Female Patterns Semi-Final against Ukraine. Her Bronze medal was a great reward for her dedication to training, as she had to defer her Leaving Cert French Oral exam to compete. Mr Leon McSherry finally achieved his lifelong ambition of getting to a European Patterns Final. He has lost out in the last three Europeans at the semi-final stage but this time he reached the Final of the 5th Dan Male Patterns where he faced Sweden. In a dominant display he won with a 5-0 victory to claim the coveted Gold Medal! 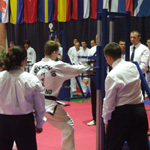 The level of competition was extremely high in the Sparring divisions with Russia and Ukraine dominating most sections. The Squads recent seminars with Mr Konstantin Yurikov paid off as none of them looked out of place in the ring against high level International opponents. 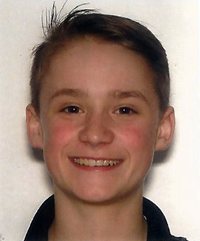 Alex Byrne picked up our third medal with a Bronze in the -50kg Male Child Sparring division. After a comfortable win over Romania he faced a much taller Russian in the Semi-final. The Russians reach proved too much for Alex over the two rounds. It was a great achievement in his first Europeans to win a Medal. The Coaches would like to congratulate all the competitors for their dedication and hard work. They represented Ireland with pride and were a pleasure to coach. We hope that everyone uses the experience gained to take the next step in their International career. Although we have just returned from the 2016 European Championships the preparations for 2017 are underway. We must build on our success and continue our training throughout the Summer. 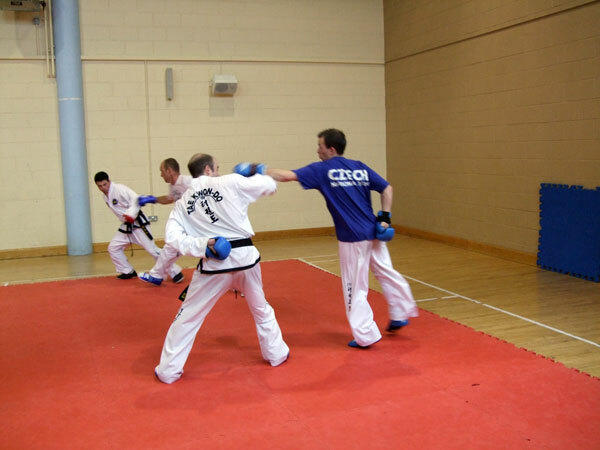 Those who competed are expected to attend the next Open Squad Training Session on Sunday 15th May in Tymon Bawn Community Centre, Tallaght, Dublin 24, so everyone can learn from their experiences. We are looking for competitors who are enthusiastic to learn and have the dedication to commit to high-level training so we can send an even bigger Squad to Liverpool 2017. 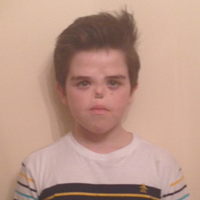 Congratulations to Mr Leon McSherry who won bronze at the European Championships in Italy. After his Bronze medal in 2014 he was seeded into the quarter-finals where he faced Sweden. In an impressive display which included the technically difficult Juche as a designated pattern he beat the Swede 5-0. Mr. McSherry then faced Greece in the Semi but just lost out in a very tight match. The morning session at day one of the euros saw our three juniors in action in their pattern divisions. 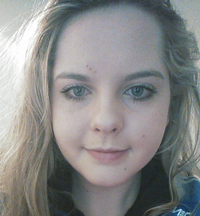 Caoimhe Keogh had a win against Spain but narrowly lost to England in the quarters of the II dan division. Hannah Eade beat Bulgaria then lost out to Russia by a point on the judges scorecards in the I Dan division. 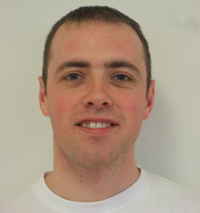 Shane Grehan had a tough start to his first Euros by losing out to the Czech in the I Dan section. The afternoon session saw the adults competing in patterns where Mr Patrick Choi lost out in the quarter finals of the II Dan patterns to the Czech after beating Latvia and Mr Martin Mahoney lost out to Wales in the III Dan section. It was the first time the patterns scores were displayed on the ring screens which showed how close international competition is. On day two of the euros there was heartbreak for Shane Grehan in the sparring, after being awarded a win against Bulgaria in a tough fight which went 3 rounds it was then declared a draw following a protest by the Bulgarians for an incorrect warning. There was then a further 6 minutes of golden point sparring where both fighters thought they had it until the Bulgarian finally got two judges decisions to end it. Hannah Eade also had a battle with a Bulgarian in her first bout but after leading during round 1 she narrowly lost out in the end in a spar that could have gone either way. Later Caoimhe Keogh and Mr Mahoney lost tough bouts against Greece and England respectively that gave them valuable ring experience for the future. The Juniors of Shane, Hannah and Caoimhe at their first black belt Euros showed they belong on the international stage and the future of the RITA National Team looks bright. With ITF England's successful bid for the 2017 Euros in Liverpool it will be an exciting opportunity for us to send a large team. We hope that some of the colour belt squad will be able to travel with the Black Belt Squad to the Euros in Thessaloniki, Greece next year to compete in the Child section (10-13 years) as red belts then move in to the Junior (14-15, 16-17) division as black belts for 2017. Competing at this level requires a lot of dedication but the RITA coaches will offer all the support and training possible plus watch out for special training sessions with International coaches/competitors. Remember the Euros has Child, Junior, Adult and Veteran divisions so age is no barrier to compete. We will be looking at all the members who show potential at squad training and competitions so make sure you attend! We would like to thank The Audi Centre (www.audisouthdublin.ie) for their kind sponsorship donation. We would like to wish the Irish Squad the best of luck at the EITF European Championships. The team head off on Monday to compete against Europe's best at the Championships in Andria, Italy. The squad will be accompanied by the National Coach Master Stephen Doyle and by the EITF selected Umpires Master Robert Howard, Master Floyd Keane and Mr. Donal O'Doherty. 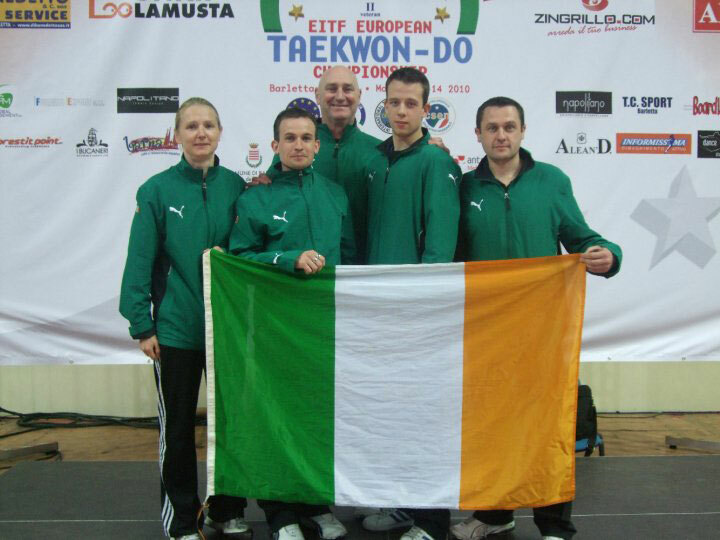 Congratulations to the Irish representatives at the EITF European Championships on winning 2 Gold, 1 Silver and 1 Bronze. The team consisted of Umpires Senior Master Francis Barrett, Master Robert Howard and Master Floyd Keane, Competitors Mr Leon McSherry and Ms Patrice Conaty, and National Coach Master Stephen Doyle. They travelled to the Belarusian capital of Minsk to participate at the 29th Adult, 20th Junior, 6th Veteran & 4th Childrens European Taekwon-Do ITF Championships from 7th - 14th April. 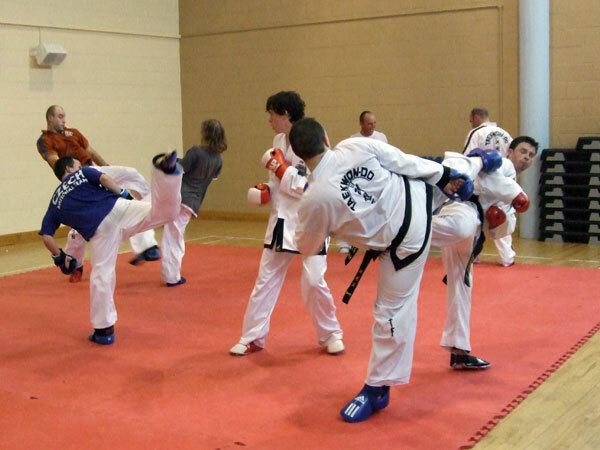 525 competitors and 39 teams from 25 countries took part in a festival of Taekwon-Do. Next years championships will take place in the south of Italy in May while Greece was selected to host the 2016 event. The Irish Team were crowned Four Nations Champions after an exciting and nailbiting competition during the Irish Open, The Four Nations is a unique annual event between the RITA and UKTA teams of Ireland, England, Scotland and Wales which has been running since 1988. Originally a male only event this year saw mixed teams of males and females competing. The last time Ireland won was back in 1996 and there have been many heartbreaking second places until Saturday saw them lifting the FGM Ki Ha Rhee Cup. 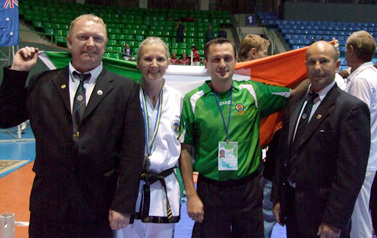 The Irish Team consisted of Captain Leon McSherry, Adam Fox, Gerard Finn, Laura Tobin, Roisin O'Neill and Patrick Choi, they were coached by Master Stephen Doyle who himself was on the first Irish Team to win the Four Nations in 1994. In the opening event of Patterns Ireland beat England then Wales to claim all 3 points. Next it was Wales who won the Sparring by beating Ireland and then England in the final to set up an exciting climax in the last event of Power Breaking with Ireland on 4 Points and Wales on 5 Points. Ireland needed to better the Welsh placing due to Wales getting 2 points for finishing second in the Patterns, Going into the last two techniques Wales were ahead but the Irish Team took a gamble on increasing the amount of boards they would break and with everyone holding their breath Mr Choi and Mr Finn kept their nerves and broke 3 bords each to secure first place in Power and the Four Nations Cup. Both Wales and Ireland had finished on 7 Points which meant it came down to the result in Patterns. The RITA would like to thank the competitors and coaches of the UKTA Teams for putting on a great show and congratulate the Irish on a historic win! 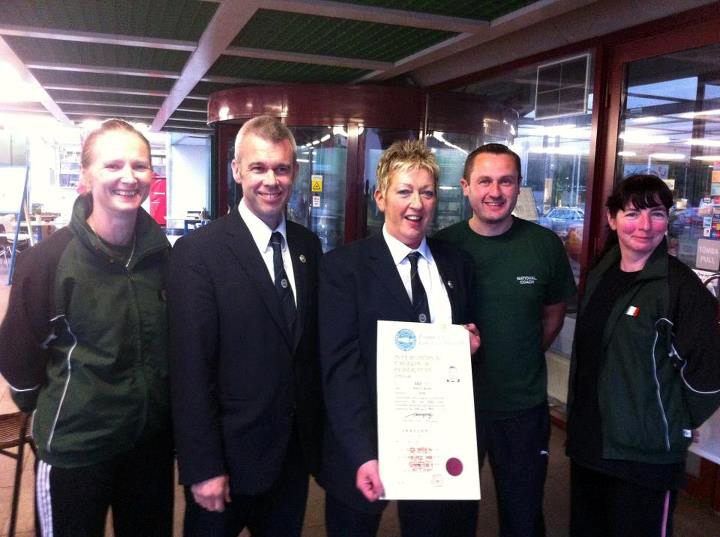 Glasgow will host the 2014 event on November 22nd at which it will revert back to a Male Team event with a separate Female competition being run at the same time. 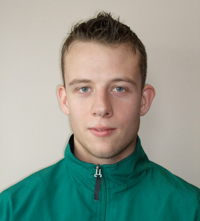 Congratulations to Mr Adam Fox on winning Silver in the Power event at the recent European Championships in Slovenia. The Power section was the last event of the week to take place and Mr Fox being third to attempt to qualify had an agonising wait watching the rest of the field try to beat his score. Only the Greek contestant was able to beat it by one point giving him the Gold while Norway finished one point behind to claim Bronze. This is Mr Fox's second time winning a medal in Power at the Europeans as he also won Silver in 2001 in Spain. 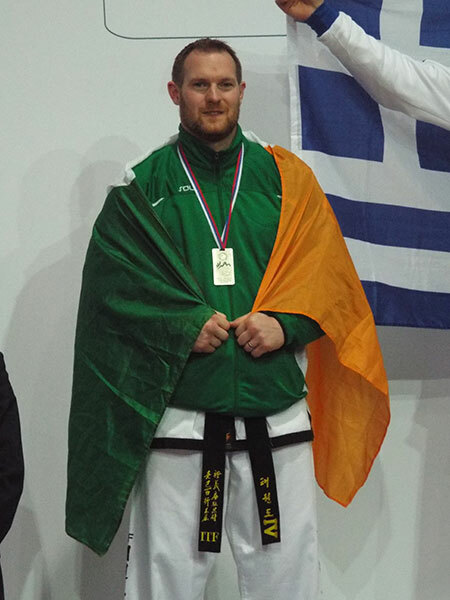 Ireland only other competitor Mr Leon McSherry lost out in the quarter finals 3-1-1 to the eventual Gold medalist from Russia in the IV Dan patterns. Our three selected Umpires also had a good championships with Senior Master Barrett being selected as Jury president and Master Howard and Mr Keane selected to be centre referee for many of the top matches. 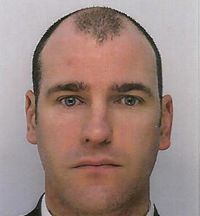 In particular Mr Keane had the honour of being selected for both the adult male and female team finals. The 10th Junior & 5th Veteran ITF Taekwon-do World Championship held in the Estonia Capital Tallinn were highly successful for the Irish contingent. Not only did they win three Gold and three Bronze medals but also Master Valerie Keane received her Certificate at Congress from the ITF President Chang Ung. 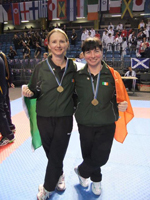 The first day saw Ms Audrey Condon from Kilmacow win Gold in the 4th Dan Veteran Silver Class Female Patterns followed by Gold for her student Ms Patrice Conaty in the 1st Dan Veteran Silver Class Female Patterns. Ms Conaty who is also the European Champion beat Argentina and Northern Ireland to face the reigning World Champion from North Korea in the final. 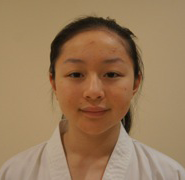 Lauren Bradshaw from Red Star was in a tough division of 31 countries for her Junior Female 1st dan Patterns. She beat Mongolia in round 1 and then lost out to Bulgaria. 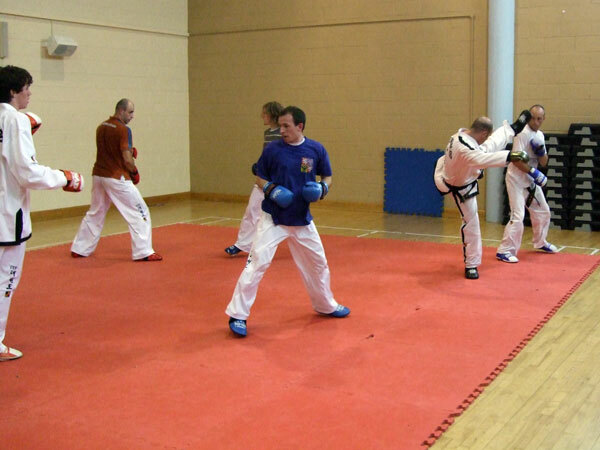 Day two saw the sparring sections begin. 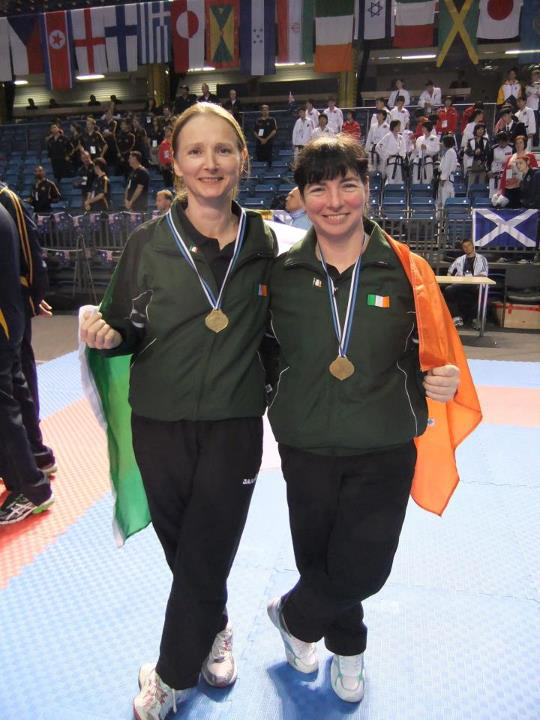 Ms Condon won her second Gold in the -61kg Silver Class Female division. She beat the Argentine competitor with a commanding second round after being behind from round one. Two more bronzes followed with Ms Conaty losing out to England in her semi final and Lauren Bradshaw losing to Bulgaria in the junior division. Ireland secured their final medal on the evening of day two in the Veteran Female Power division. Both Ms Conaty and Ms Condon made it through the elimination. After the second round England had won the gold but Ms Audrey Condon was tied with Russia and North Korea for Silver or Bronze. 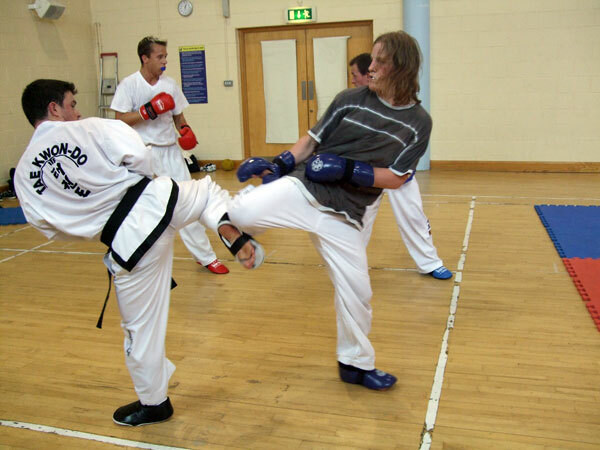 Three more rounds of breaking later Russia won Silver leaving Ms Condon against the North Korean for the Bronze medal. One more round of board breaking saw the Korean eventually beaten giving Ms Condon the Bronze medal. The team including Irelands ITF invited Umpire Master Robert Howard and National Coach Mr Stephen Doyle were greeted by RITA President Grand Master Robert Howard and a cheering crowd at Dublin Airport on their return. The RITA would like to congratulate everyone for their hard work and dedication. 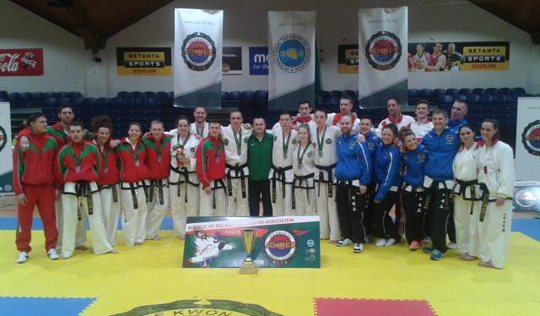 Congratulations to the ITF Ireland team who had a successful European Championships in Bulgaria with 4 Gold, 2 Silver and 2 Bronze. Day one started off with Mr Mark Pollock winning Bronze in the Veteran male 3rd dan patterns followed up with Ms Patrice Conaty winning the Gold in the veteran female 1st dan patterns. There was disappointment for Hannah Eade and Roisin O'Neill who lost out in their quarter finals to the eventual winners in Child red belt and Junior black belt pattern divisions. Kia Conaty-Carley also had a great performance in the Red Belt child patterns. Day two saw Ms Patrice Conaty winning Silver after losing out in Sudden death golden point in the +75kg Veteran Female Sparring Final to England. 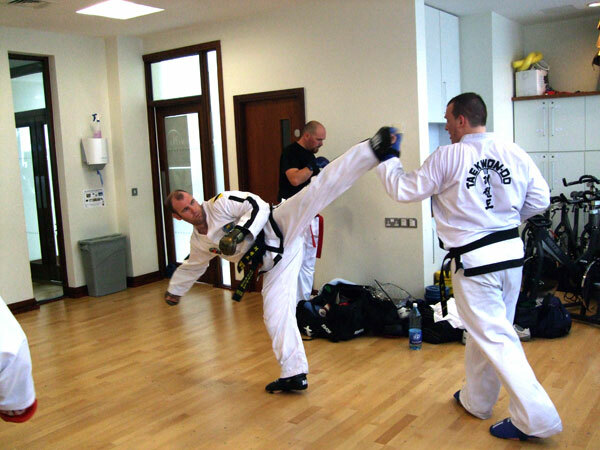 Mr Mark Pollock went though to semi finals of veteran +90 sparring after a tough match against Czech Republic. 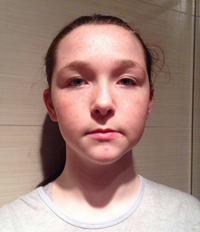 Kia and Hannah had tough starts to their International sparring careers with both getting a Russian in the -165cm female child sparring divisions. The more experience Russians won but both Irish girls showed great potential for the future. Day three had a great start with Mr Pollock moving into the Final against Serbia after his Bulgarian opponent withdrew. He then went on to win in a hard match with the Serbian. This was quickly followed up by another Gold with Lauren Bradshaw showing great skills to beat her Russian opponent in the Final of the 14-15 Female +70kg Sparring. Lauren had earlier won against Greece and Bulgaria to get to the Final. Unfortunately there were no more medals but some brave performances in sparring from Dylan Russell, Roisin O'Neill, Leon Brennan and Lauren Russell. Great experience for the future. On Day Four Ms Conaty picked up a Bronze in the Female Veteran power division. Ciaran Pollock and Neidin Coulihan were sparring action but lost out to very experienced fighters in the 16-17 +75 kg male sparring and -75 Kg Adult Female Sparring respectively. The new exciting team sparring event of "Power Taekwon-Do" was demonstrated with Russia winning the full contact matches against Croatia and Bulgaria. 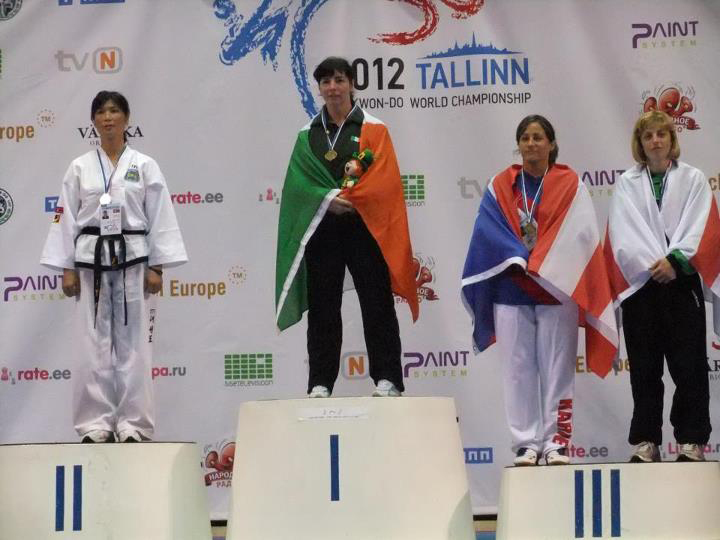 Day 5 was a great end to the European Championships with Ms Neidin Coulihan winning the Silver in Female power breaking. Earlier in the day Ms Patrice Conaty won Gold in the Mixed Veteran Self Defence Routine with Mr Adam Fox and Mr Mark Pollock. Mr Pollock then won bronze in the Male Veteran Self Defence with Mr Adam Fox, Dylan Russell and Ciaran Pollock. As part of the RITA's 40th Anniversary there will be a male senior International match on Saturday 1st December in Dublin. This will be against a European Team. Only members who have attended Squad Selection for the 4 Nations will be considered. That event is scheduled to take place in Wales on 27th October and is open to Male & Females, selection will start at Squad Training on Saturday. A senior female event is also being planned. As all of you know well, we reached the decision at the 21st ITF Congress held in Pyongyang, DPR Korea in last Sep. to divide the age groups at the Sparring Competitions for both Individual and Team (Male and Female) from the coming Junior World Championship in Estonia into 2 groups of 14-15 and 16-17 years old. 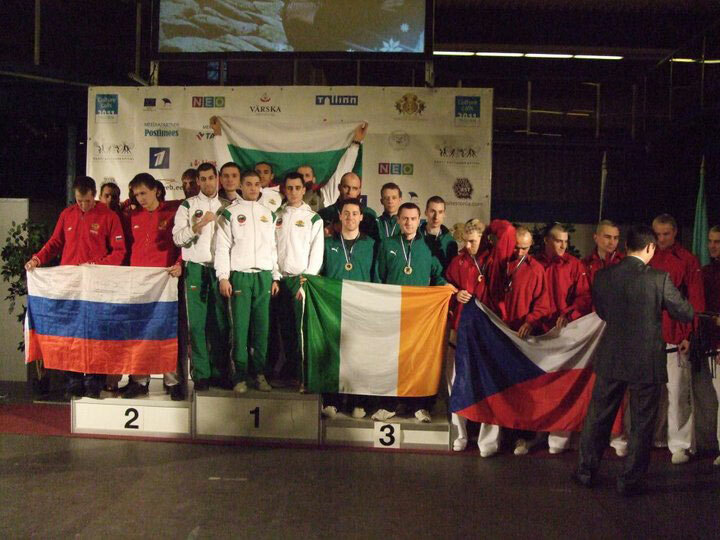 Congratulations to all those that have been selected to represent Ireland at the 2012 European Championships. Congratulations to the Irish Team who won 2 Gold and 5 Bronze plus the Overall veteran award for Mr Mark Pollock at the European Championships in Tallinn, Estonia. 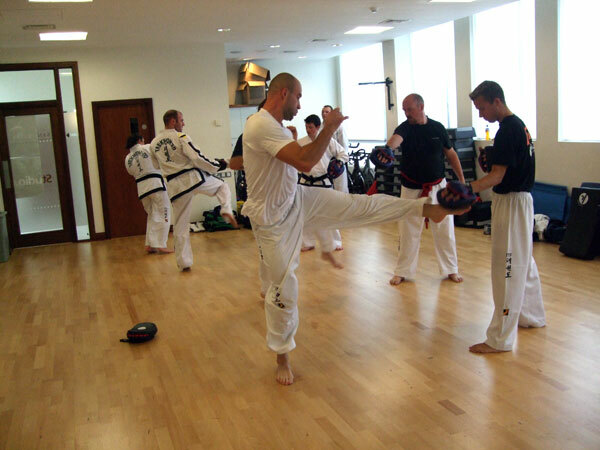 The team also won 2 Gold, 1 Silver and 4 Bronze at the International Martial Arts Games. The Irish Umpires of Senior Master Barrett, Master Howard and Mr Floyd Keane worked tirelessly for 5 days and were chosen to be Chief Umpires in all their rings. Next up for the Irish Team will be the Adult World Championships in North Korea. Congratulations to the RITA members who won 4 Gold and 2 Bronze at the European Championships. The event took place in Barletta, Italy where 29 countries were represented. Ms Audrey Condon from Kilmacow picked up 3 Gold medals in the Silver Class Female Veteran division winning 3rd Degree Patterns, -61kg Sparring and Mixed Self Defence with Mr Martin Mahoney from Galway and Mr Gerard Byrne from Old Bawn. Also winning Gold was Mr Stephen Doyle in the 6th Degree Patterns. In the Male Silver Class Veteran division Mr Mark Pollock won Bronze in +90kg Sparring and Bronze in Self defence with Mr Doyle, Mr Mahoney and Mr Byrne. Next up for the Irish Team is the World Junior and Veteran Championships in Belarus at the end of August and the 4 Nations Challenge in Glasgow on October 16th. The RITA would like to thank Ms Niamh Herrity and the organisers for a great show saturday night. The annual 4 nations challenge was incorporated into a gala black tie dinner in aid of the children's charity Barnardos. Those attending were treated to some entertaining sparring matches between the countries as well as the power breaking event. Earlier on in the day England won the Team Patterns section after beating Wales and then Scotland in a very close final. 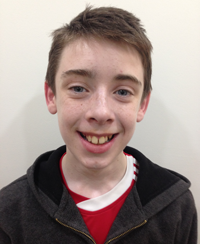 Scotland had beaten Ireland with a very good performance of the 3rd dan pattern "Sam-Il". In the sparring which was performed after the dinner Ireland again drew Scotland. First to spar was Mr Richard Barber from Stillorgan who lost out to the much taller Mr Andy Adam. Next out was Mr Martin Mahoney from Galway who had to face Mr Alan Rafferty. In an exciting match Mr Mahoney came back from a slow start to just about do enough to win the spar with some clean scoring combinations towards the end. Mr Krzyzstof Misiewicz also from Galway faced Mr Tam McMillan in the third bout. In a brusing heavyweight encounter which got both the Irish and Scottish supporters up on their feet shouting, Mr Misiewicz got the decision in another close match giving Ireland a 2-1 lead. Needing just one more win Ireland sent out their captain Mr Floyd Keane who was competing in his first event in over a decade. He was against the young star of the scottish team Mr Armin Gohsrich. Using his years of experience Mr Keane was able to rack up the points against the younger opponent giving Ireland a 3-1 win. Ireland then faced England in the Final with the crowd, many of whom had never even seen Taekwon-Do before, at this stage in full voice. Once again Mr Barber went out first for Ireland to face Mr Paul Hutchings. With only a few seconds gone the Englishman was disqualified for excessive contact after knocking out Mr Barber with a heavy punch. Fortunately Mr Barber wasn't too seriously hurt and was able to get back on his feet after a few minutes. Mr Mahoney was next out against the 6'8" Mr Greg Bagwell who used his height advantage to keep his opponent frustrated and gain the win making it 1-1. 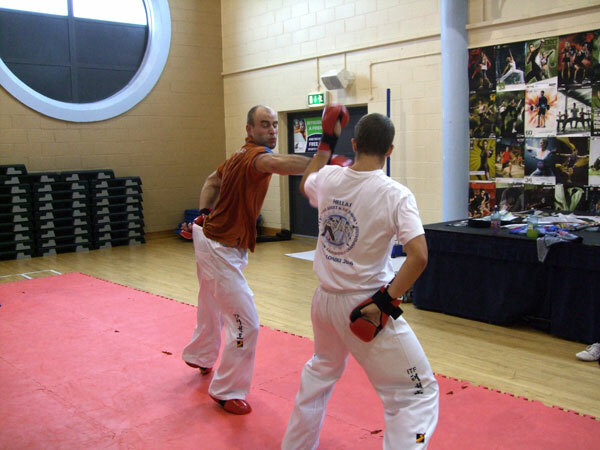 Mr Misiewicz faced off against the experienced former World and European Champion Mr Ricky Dewinton. Mr Misiewicz was able to use his power advantage to get the upper hand early in the fight causing the Englishman to change tactics to a more counter attacking spar. Unable to get close enough to score clean points Mr Misiewicz lost out in a very close fight giving England a 2-1 lead. Needing to get at least a draw in the fourth spar Mr Gerard Byrne was sent out against the much bigger Mr Tom McCabe. In an exciting match the English competitor was able to get the win giving them a 3-1 lead and also the 4 Nations Cup with two wins from the three events. The last event was power breaking in which Ireland had to come ahead of Scotland to finish in 2nd. Mr Richard Barber Punch to brick, Mr Mahoney Knifehand to tiles, Mr Misiewicz Side piercing kick, Mr Conor McCormack turning kick and Mr Floyd Keane with reverse turning kick managed to beat the Scots score by 1 point to give Ireland the Silver medal. England finished off their impressive display winning the Breaking giving them a clean sweep of 9 points. At the recent 19th Congress held in ST. Petersburg, russia on 13th October there have been some amendments to the current ITF Tournament Rules. These include clarification on Team patterns, new scoring and fouls in sparring and changes to the Power and Special technique formats. Click here to download the full list of changes. Members of the Irish Team preparing for the World Championships and 4 nations at Squad Training in the Athlone Regional Sports Centre. 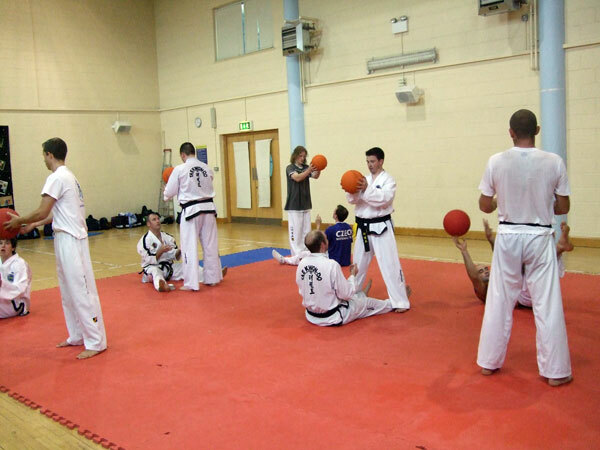 Members of the Irish Team preparing for the World Championships and 4 nations at Squad Training in the Sanovitae Gym, Liffey Valley. The Masters’ Council has recently been asked to review the RITA’s position on financial support for Irish international competitors. The Masters’ Council has decided that future international competitors will be funded based on their track record and potential. The details of this policy are currently being developed and will be presented at the AGM at the end of the year. While this policy is being developed, the Masters’ Council has agreed to pay €500.00 towards the estimated costs of flights, accommodation and entry fees of the Irish team members competing the World Championships in Russia in October. The XVI World Taekwon-do ITF Championships will be held in the city of Saint-Petersburg, Russia on October 12-17, 2009. There will be a Technical, Umpires and Masters Seminars on October 11-13, 2009 before the Championships. The ITF Congress will take place on October 13, 2009. 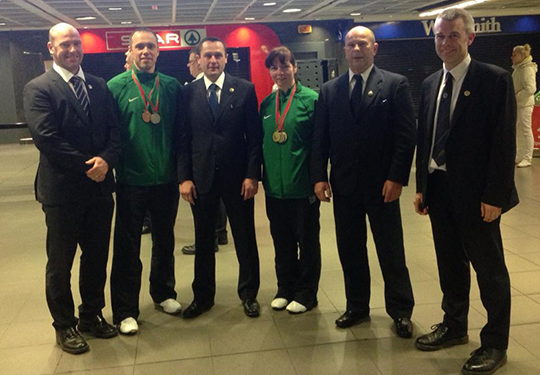 Congratulations to the Irish competitors who won 3 Gold and a Bronze at the European Championships in Slovenia. Ms Audrey Condon won Gold in the Female Veteran Silver Class -61kg Sparring, Gold in the Female Veteran Silver Class 3rd Dan Patterns and Bronze in the Veteran Female Power. 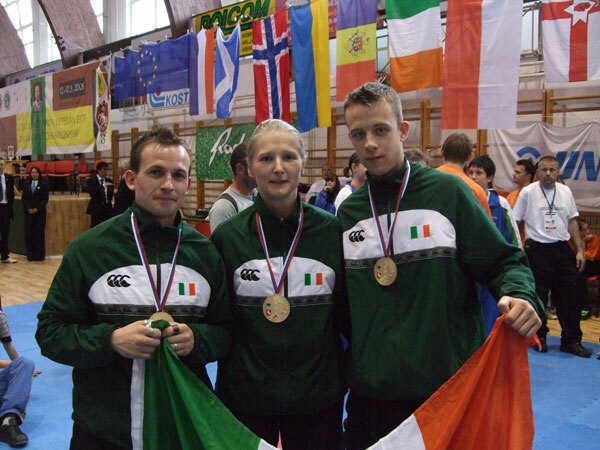 The mix self defence team of Ms Condon, Mr Martin Mahoney and Mr Gerard Byrne also won Gold in their division. 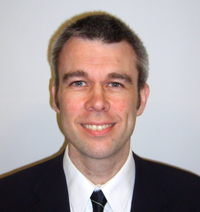 The competitors were coached by Mr Stephen Doyle 6th Degree. Senior Master Barrett 8th Degree led the Umpire delegation with Mr John Jacob and Mr Floyd Keane both 6th Degrees. RITA Black Belts Mr Martin Mahoney 2nd Degree, Mr Gerard Byrne and Mr Joseph Beadle both 1st Degrees recently travelled to the Czech Republic to take part in the Czech National Team's final training camp before the European Championships. The trio were accompanied by National Coach Mr Stephen Doyle 6th Degree. The camp was in the little town of Brandys-nad-Llebem and lasted 5 days. Not only did they get to train with World and European Champions but also had one to one instruction from the head of the ITF Technical Committee Senior Master Hwang Ho Yong 8th Degree. 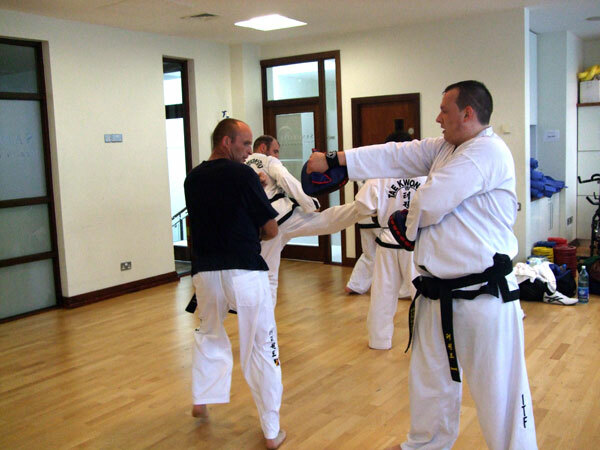 The RITA would like to announce the formation of a new acting body for the purpose of International Competition for students from ITF Registered Organisations and Schools within Ireland, as recognised by the International Taekwon-Do Federation. 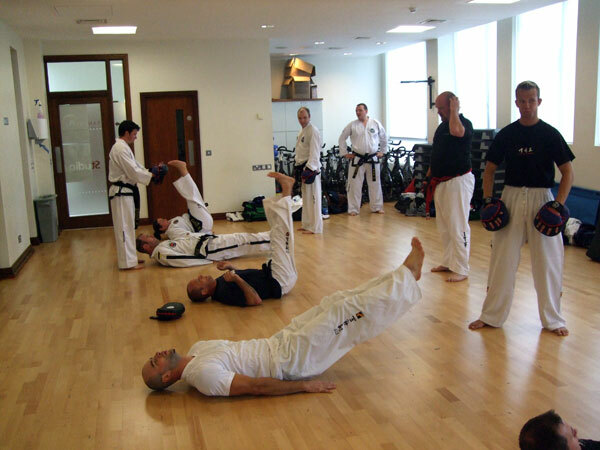 Membership is accepted freely for any Irish national body affiliated to the ITF, with Schools / Instructors operating in Ireland. From 2009 any student who wishes to compete for the ITF Ireland National Team must register first. All forms and documention along with further information will be found on the new ITF Ireland website which will be online soon. www.itfireland.ie will be the address when live. 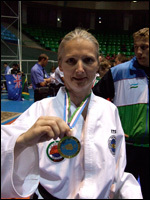 Congratulations to Ms Audrey Condon from Waterford for winning two Gold and a Silver at the World Veteran ITF Taekwon-Do Championships in Tashkent, Uzbekistan. Ms Condon won Gold in the silver class (40-49) -61kg Sparring, Gold in the Power Breaking and Silver in the 3rd Dan Patterns. This was an amazing achievement for the former World Champion who 21 years ago won a Gold and Silver at the 1987 World Championships in Greece. It was made even more special for Ms Condon as accompanying her on the long trip to Uzbekistan was her Instructor Mr John Jacob 6th Degree and her former Coach Senior Master Francis Barrett 8th Degree both from Waterford who represented the RITA as Umpires. During her Gold Medal win in the Sparring Ms Condon was cheered on from the stands by Ms Valerie Keane 6th Degree and members of St Marks Taekwon-Do School. Ms Condon with National Coach Mr Stephen Doyle 6th Degree started the competition with the 3rd Dan Patterns. After beating Australia in the semi-final she faced the local Uzbek competitor in the Final. Both showed excellent technique and it was very close but it was the Uzbekistan who got the result giving Ireland the Silver medal. Next up was the -61kg sparring. 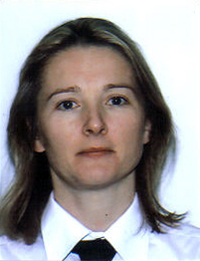 Once again Ms Condon faced an Uzbekistan competitor in the final after beating South Africa in the semi. It was a great display from Ms Condon who dominated both rounds of the Final to win the Gold. The power breaking event on the last day of the competition gave Ireland its second Gold with Ms Condon dominating once again. There were over 500 competitors from 40 countries represented at the 8th Junior & 3rd Veteran World ITF Championships and the level of competition was very high. The event was also live on the National TV sports station. As usual the DPR Korea team dominated the Gold medal awards with some stunning performances but the highlight for the large crowds was the final of the Junior Male Team Sparring. After narrowly beating the Uzbekistan team in the quarter final and then Estonia in the semi, DPR Korea faced Russia in the Final. After drawing the first fight Russia lost the next two meaning they had to win the remaining two fights to force a playoff. With the locals creating a fantastic atmosphere cheering on Russia they did the impossible and won both fights. The final went to a playoff which after a display of great Taekwon-Do sparring the Russian just about deserved the win. Slovakia will host the next Junior & Veteran World Championships in 2010 and it was announced that DPR Korea will host the World Adult Championships in 2011. The Current World -78kg Sparring Champion and the new -85kg European Champion Jan Mraček will be training with the Irish Squad. 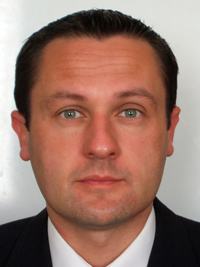 Jan is Captain of the Czech National team who are World and European Gold Medallists in Team Patterns. Accopanying Jan is Kateřina Čížková who is a member of the Czech female team who won Gold at the recent European Championships. This is a great opportunity to train and spar with one of the best fighters in the World. 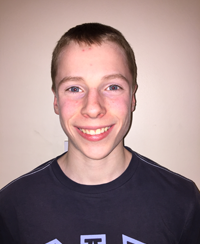 Congratulations to David Freeman from St Marks who won a Silver medal in -57kg Sparring at the recent European Championships in Croatia. This was a great achievement as he dislocated his shoulder during the semi-final and the doctors did not want him to continue. Though in great pain he had to spar an extra time against his Greek opponent and won comfortably in the end. Unfortunately Mr Freeman was unable to contest the final due to doctors orders which meant Russia got the Gold. He was unlucky to lose out to Russia in the quarter finals of the 1st Dan Patterns. The judges gave a draw so it went to a play off pattern which the Russian won. He also got through to the final round in Special Technique and finished in the top ten. 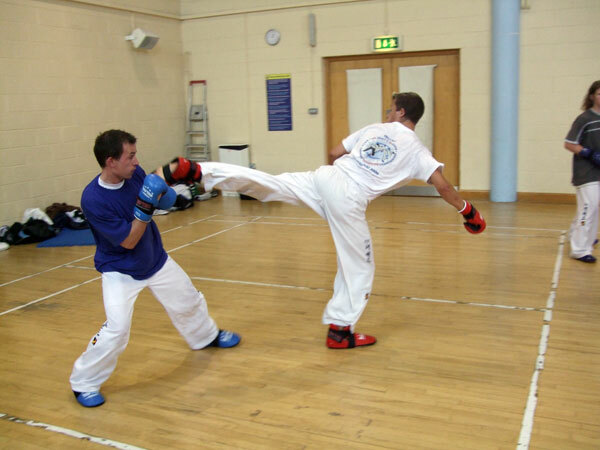 Martin Mahoney from Galway had no favours in the -64kg sparring. After dropping from his normal -71kg section he got the Ukrainian World Champion in the 1st round. 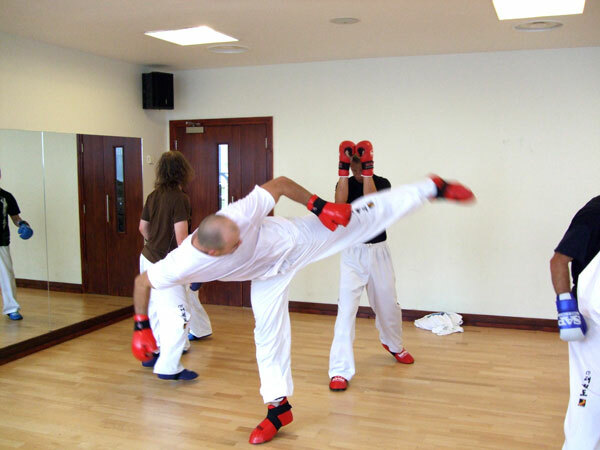 In a competitive spar the Ukrainians experience gave him the edge and Mr Mahoney lost out. In the power event he came 10th which was a very creditable result. The RITA would like to congratulate both our competitors who performed so well and also to our Umpires Senior Master Barrett, Master Howard and Mr O'Donnell who showed why Ireland has some of the best Umpires in the ITF. With 700 representatives from 31 countries this was the largest European Championships so far and the competition was of a very high standard. 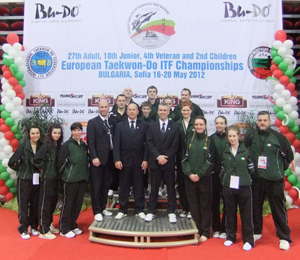 The next European Championships will be held in Slovenia during April 2009 and for the first time will have a Veterans division. Congratulations to the Irish Squad who won Silver and Bronze medals at the European Championships in Tallinn, Estonia. 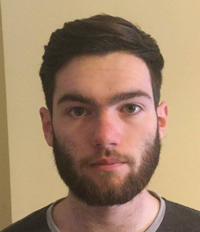 David Freeman repeated his Silver medal in the -57kg Sparring while the Male Team of Adam Fox, Leon McSherry, Mark Jordan, Joe Gill, Martin Mahoney and David Freeman won Bronze in the Team Patterns. The Czech National Team have invited members of the RITA to attend a unique training event from July 27th to August 3rd 2008 in Trebon, Czech Republic. This is a great opportunity to train with World and European Champions from the Czech National Team and also with other International competitors. For more information visit http://www.czechsummerchallenge.com or contact the RITA National Coach.